After working all year, it seems unbelievable that in a few short weeks the grapes will be gone for another year! A bit sad? Yes – we have to wait a whole year to have acres of grapes to eat! 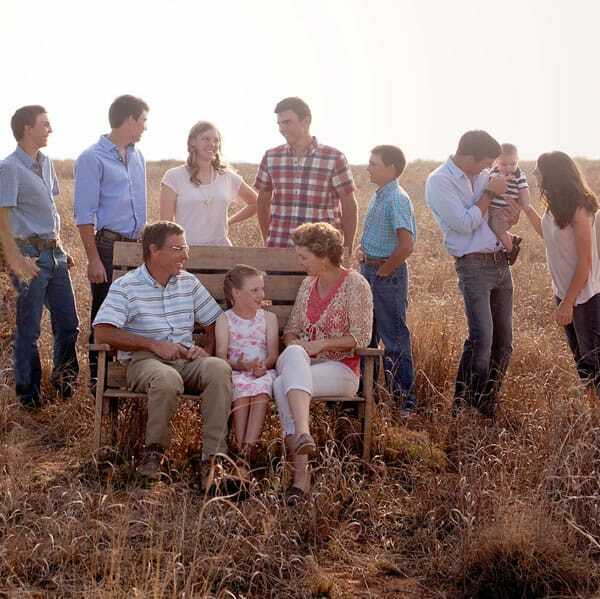 But, the thrill of harvest – and money in the bank – outweigh the sadness! Our earliest ripening variety is Roussanne. To see how we determine ripeness see pH and Brix Testing. Roussanne is a French white grape variety. We have 7.2 acres of Roussanne which is contracted to 7 different wineries. Each winery has a specific acre of grapes which is 3 rows that are 1/3 mile each. And, yes, that is a looong row when you are out there working! Because wine-making is an art, as well as a science, each winery has different parameters in which they want their grapes harvested. 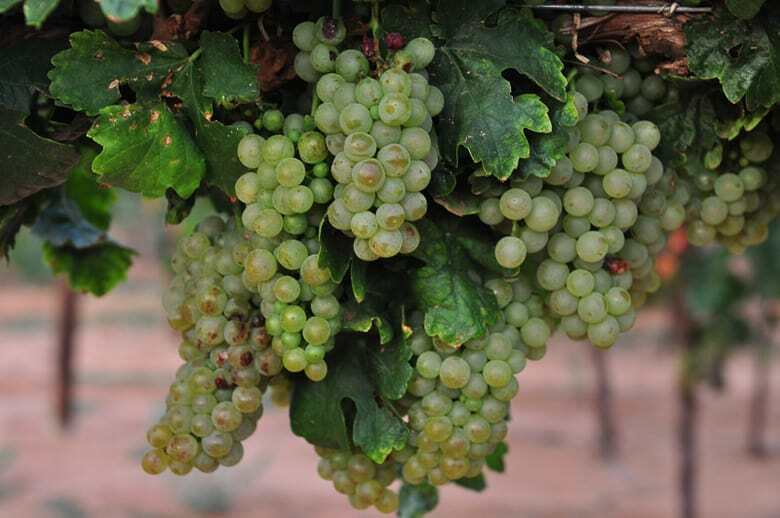 Most want the Roussanne to be between 24 – 26 Brix. The flavor of the Roussanne is enhanced in the final days of hanging on the vines. But, the pH also rises. Most winemakers prefer a pH of well under 4.0 and the pH of the Roussanne is close to, if not over, 4.0 by the time the varietal flavors are present. Part of our job as grape growers is to harvest the grapes when the winery is satisfied that the grapes meet the parameters necessary for the style wine they intend to make. 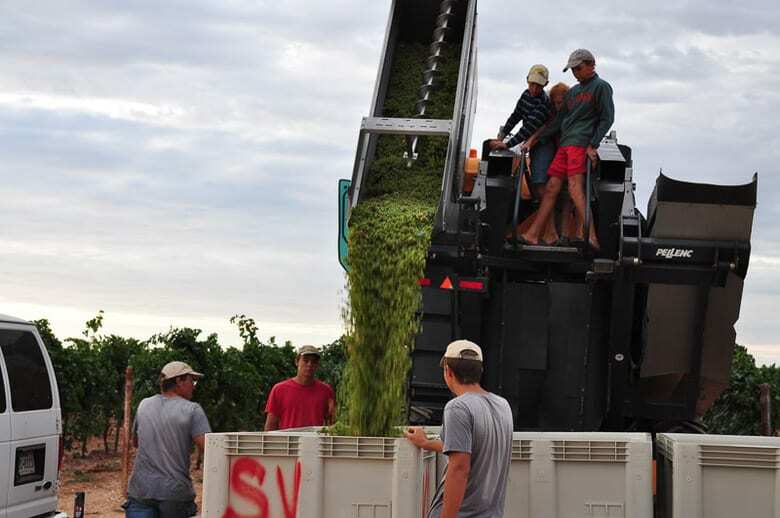 This week marks the first week of grape harvest for 2014! The first acre of Roussanne to be harvested this year is now on its way to its winery, Spicewood Vineyards. 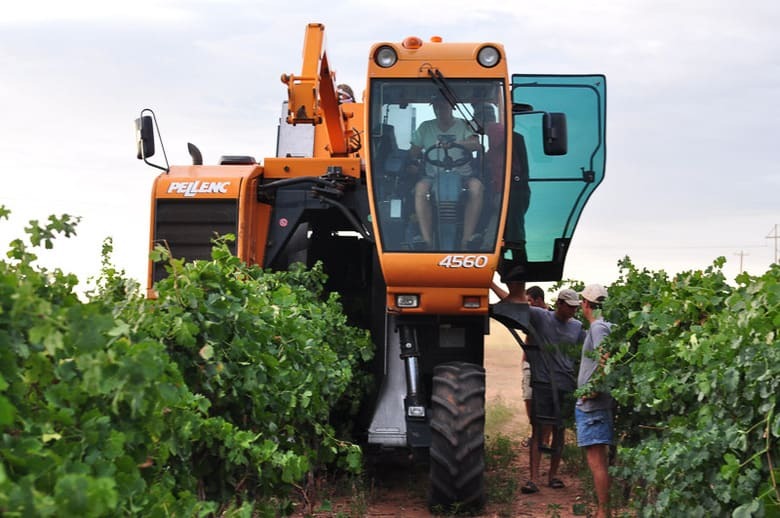 Using our Pellenc 4560 grape harvester that we purchased in 2012 (which you can see in action in this video) we began harvest around 8:30 am. 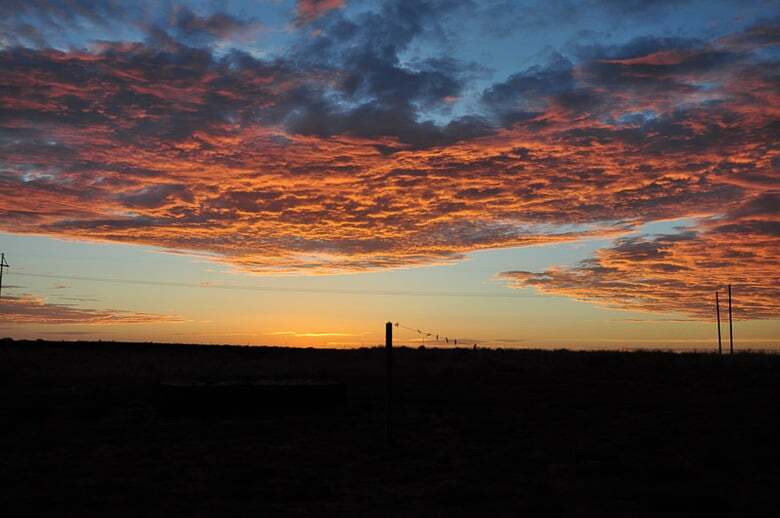 We were actually awake for a beautiful west Texas sunrise – something I normally see only when it is my turn to milk at 6 am! 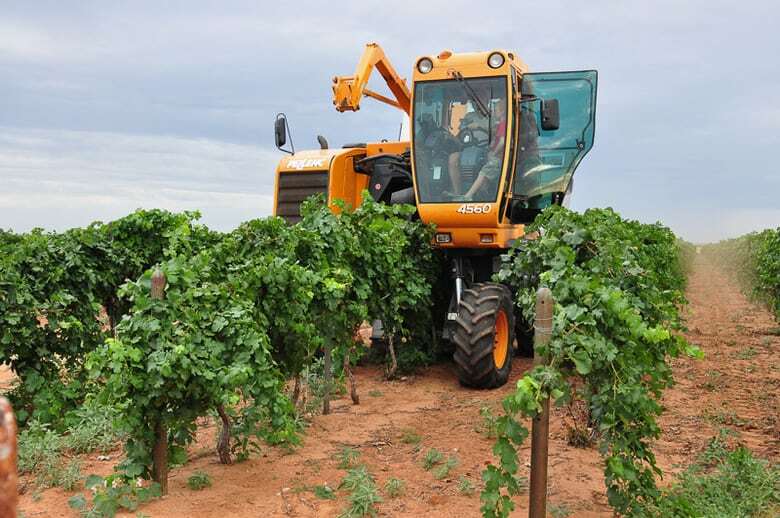 The Pellenc grape harvester rides over the rows. For this harvest the speed was a bit over 3mph. Bow rods inside the machine vibrate and shake the ripe grapes off the vines. 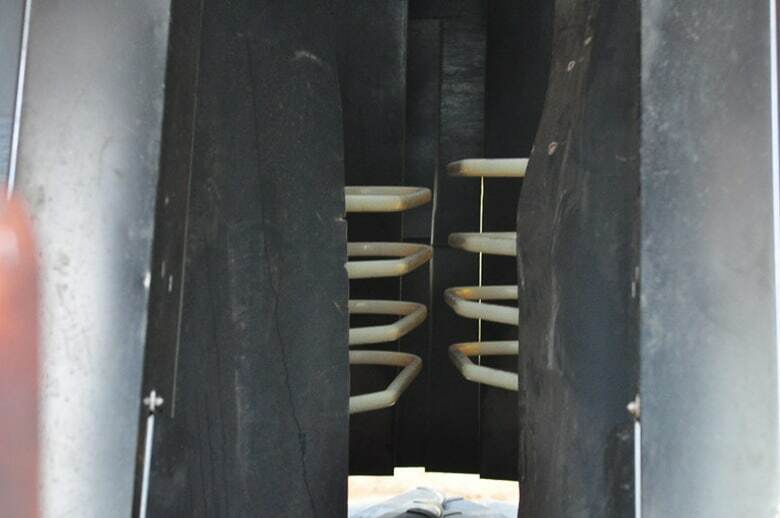 The speed at which the bow rods vibrate can be adjusted for heavier or lighter shaking as well as adjusted up and down depending upon where the grapes are in the canopy. You can see the bow rods inside the Pellenc in the photo below. 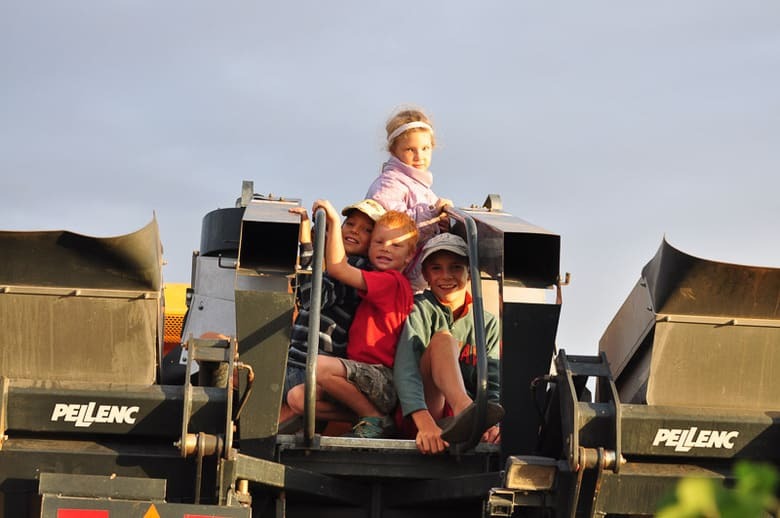 Everyone likes to ride on the grape harvester and the top of the Pellenc offers a great view of the vineyard! The Pellenc is normally driven by one of our sons – John will drive but normally it is only at their insistence! One thing we don’t want a lot of is MOG or Material Other than Grapes. This could be bugs, birds, bird eggs, sticks, dead leaves, cutworms… In fact, the wineries will dock our contracted price if there is a high percentage of MOG. Thankfully, we have never had this problem but we do pick out obvious items of MOG that we see. 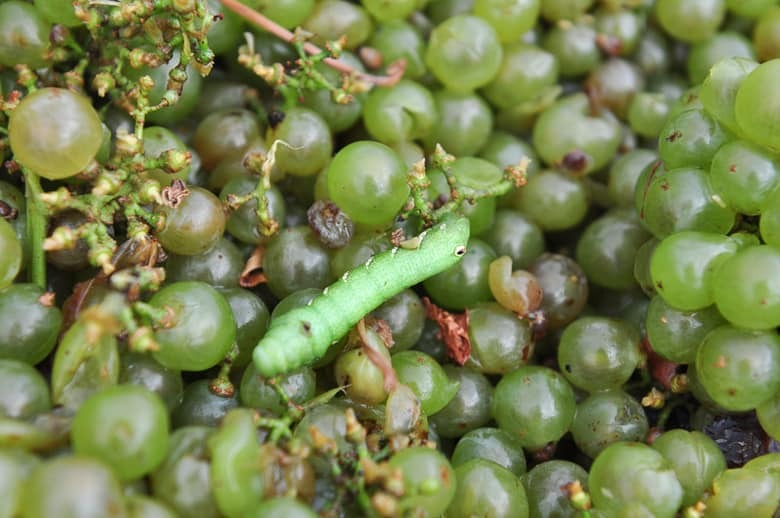 In the photo below, a cutworm, which is MOG, made his way to the top of the grape bin. Don’t worry though, I picked him out! 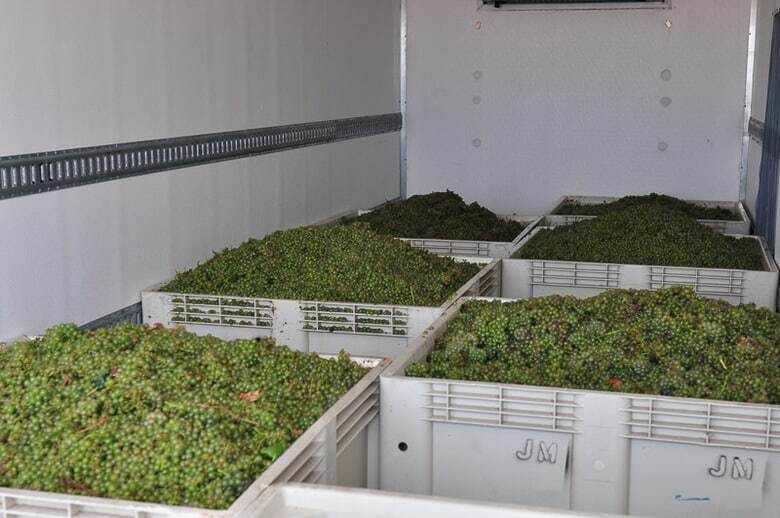 The first acre of Roussanne harvested was just shy of 7 tons. We prepare for harvest all year and now that it is here, excitement is in the air – I wish you were here to experience it!